Frequent questions about planning a Great Migration safari. All people traveling to the East African region require a passport that is valid for six months beyond the intended length of stay. The entry requirement for any travelers entering Kenya and Tanzania is a minimum of two blank pages in their passport. Don’t forget to bring your yellow fever health card as they will check it carefully at the border. Am I guaranteed to see the migration in action? As a visitor in a national park, you are never guaranteed to see anything. It’s not a zoo. In reality, there is no such single entity as “the migration”. 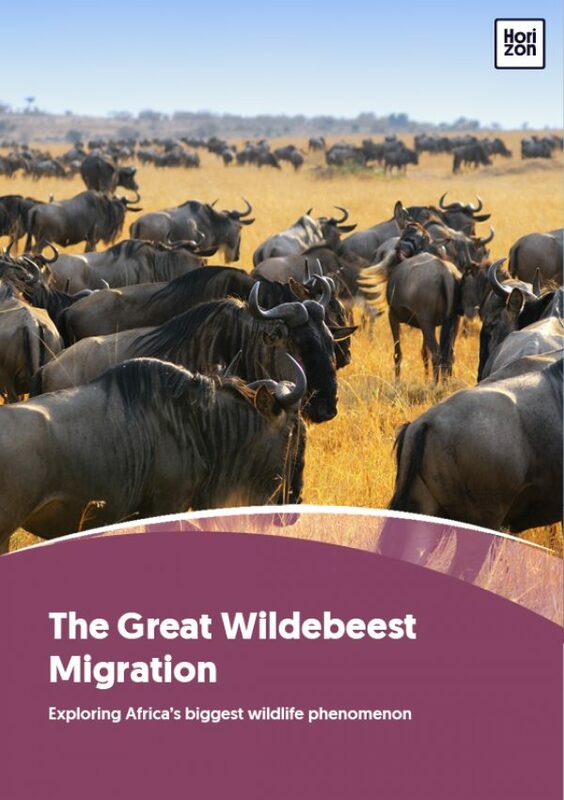 The wildebeest are the migration – there is neither start nor finish to their endless search for food and water. The only actual beginning is the moment of birth taking place in Ndutu (see February). There is little predictability about the migration, but the key factor is the weather and the cycle of four seasons. However, don’t count on these time periods, as the climate is changing, causing less predictable animal behavior. How does a private safari compare to a group safari? The main difference is exclusivity. In a group safari vehicle, especially the less comfortable and more cramped minibuses, you sometimes have to fight for space and compete with the demands of other travelers. Even if you see something really interesting and want to make a photo stop, the other guests may not agree. Sure, it’s less expensive going with others on a group safari tour. But remember, if this is a once in a lifetime trip, you’re going to regret not paying that extra money for the freedom of your own vehicle. In a private safari jeep you can design your own program and stop wherever you want, for however long. The guide will also have a chance to be more intimate, answer your questions and try to meet your specific requests. And with so much to see and experience, that’s worth every penny. What does a typical day on an East Africa safari look like? At around 6:30 you will get your wake-up call. After coffee or tea and a quick bite, head out into the bush. Wildlife is most active in the early morning. You will be accompanied by your guide through the bush for three or four hours, searching for wildlife and learning about animals and the environment. After the game drive, you’ll return to your camp for breakfast. The midday hours provide you time to relax. At noon you will be served lunch, then you’re free to take a nap or enjoy the facilities of your camp. Usually tea and coffee are served again in the afternoon. At around 4pm it’s time for your afternoon game drive. Venture back into the bush with your guide. Sometimes he will organize sundowner drinks at a well-appointed spot. When the sun is starting to go down you return to camp, where a buffet or three course dinner will be served. Settle in for a well-earned drink at the bar or the campfire. As you retire to your tent, enjoy the sounds of the bush and a canopy of stars in the night sky. Do safari camps / lodges have water and power? No matter where you stay, there will always be access to water and electricity. If you’re in a luxury lodge you have nothing to worry about, and even the most remote mobile bush camps have surprisingly functional setups. The tent might be equipped with a simple ”bush shower” consisting of a solar shower bag, but the water will be heated. The bush camps are often run by a generator that is turned off at night, so it’s a good idea to charge your batteries before going to bed. Just in case, most safari vehicles will have chargers, giving you the chance to top off your batteries during the game drives. In Tanzania and Kenya the power sockets are of type D and G. The standard voltage is 230 V and the standard frequency is 50 Hz. Your need for a power plug adapter depends on the power plugs used in your own country. Choosing among African safari companies can be overwhelming because there are literally thousands of them in the market. How to make an informed, safe, and affordable choice? Most people opt for word-of-mouth recommendations from others. Some of the best advice you can get about a company is from someone who has been on a safari with them in the past. There are dozens of websites that list safari trip reviews and journals written by previous travelers. Learn from them. Once you have shortlisted safari operators, do your due diligence to make sure they are reputable. Again, check online with various associations and other third party verification. When contacting them, ask the right questions. Find out how many other people will be on your trip. Make sure it’s clear what's included and what's not. Try to see the car before booking. Find out what their payment policies are. Get a clear explanation of their cancellation and refund policy, and find out exactly when payments need to be made. What are the vehicles and guides like? Vehicles are usually Toyota Land Cruisers or Land Rovers, as they are best suited for the terrain. For larger groups, 4WD buses are mostly used because they are more convenient for groups who want to be all together in one vehicle. Most of the drivers are full time safari guides. They have been trained in customer service, wildlife knowledge and environmental issues. They are always familiar with the routes and knowledgeable of the area’s geography. Don’t be afraid to ask questions. It’s a good way to get to know your guide, and it’s his job to teach and make you feel comfortable. Will I have a chance to interact with local people? Many of the trips provide opportunities to visit local Masai villages and interact with the local people. However, if your itinerary does not include these visits, you can always check with your lodge. Most places provide organized tours to the villages. For a relatively small fee you can go on a half day tour, often with a Masai guide who knows the people. He can explain their culture and way of living, acting as a translator for your questions. Included in the fee is also the opportunity to take pictures. If it feels a little staged, that’s because it often is. Many of these tours are tourist traps with Maasais dressing up and performing just for your visit. Of course! A family safari is a wonderful way to learn and grow together. But don’t forget to check with your lodge before booking anything, as some of them do have age limits. Most camps have good facilities for children and the vehicles are comfortable, even for long hot drives. But most of all, letting your children experience real animals in the wild is much more rewarding than looking at them in a zoo. They will make memories that lasts forever and hopefully gain a deep and valuable interest in nature. Despite being in some of the remotest places on Earth, most camps, lodges, and hotels can accept payment by credit card. On safari, almost all major expenses (all meals, activities, and often drinks) are covered in the costs of accommodation. What is a normal budget for a safari in East Africa? For all-inclusive safaris, consider a starting point of $4000 per person for a seven day trip, and then upward from there. If you do not mind longer drives and moderate accommodations, you may be able to drop that price point to $2500. The more you spend on your safari, the more exclusive and diverse your experience will be. Fancy is not necessary, but the more expensive properties generally present more opportunities for unlimited activities such as night drives, walks, and village visits. While viewing wildlife, there is always a degree of danger. The behavior of wild animals cannot be guaranteed. However, most animals are frightened by the sight and smell of humans. Rather than attack, they’ll flee (unless cornered or provoked). Attacks on humans are rare. While on safari you will be accompanied by licensed guides who are well trained and armed with an amazing understanding of the wildlife with which they share their lives on a daily basis. At your tented camp or lodge it is not uncommon for wildlife to wander through, since camps and lodges are typically not fenced. Never venture outside your accommodations at night without your guide. Always consult with your guide when in doubt. The food served at most up-market safari lodges and tented camps is of the highest quality available. Gourmet cooks bake fresh breads and prepare soups, salads, and entrees fit for tables at top restaurants. Meals are international in taste, with soups, salads, cold meats, pasta dishes, meat and fish dishes, and breads. Your day normally starts with tea and biscuits before your morning activity. Returning to your lodge or camp late morning, brunch is served -- cereals, fruit, bacon, eggs, sausage, and toast are on offer, as are salads, quiches and cold meats. Before your afternoon activity, tea and light snacks are served. Dinner consists of an appetizer followed by meat, fish and pasta dishes served with assorted vegetables and sauces. Dinner is followed by coffee (or tea), cheeses, and gorgeous desserts. It is wise to drink only bottled drinks, which are readily available. Ask that waiter to open it in front of you, as they may try to reuse the container at some of the larger, lower quality lodges. In addition, don’t swallow water during a shower and use purified water for brushing teeth. Internet access is available at most large lodges and camps, sometimes for a small fee. Unfortunately, it is very slow and sometimes doesn’t work at all. When on safari you’re not likely to be able to get a signal. But don’t worry – in case of an emergency your guide will be able to communicate with the lodge and with other vehicles. Think of a safari as a chance to unplug!